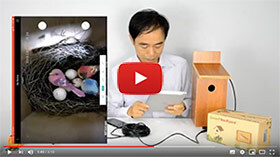 The IP bird feeder camera supports both Wire and WiFi connectivity. Wire connection requires you wiring Ethernet cable from the camera to network switch. Accessories PoE injector and splitter help you use single cat5e cable to carry both power and network to the camera. If you plan to use WiFi, test the signal coverage around the installation place. 2. Connect another terminate with the DC12V power adaptor. 4. Plug the adaptor to outlet. NOTE: The camera will take around 2 minutes to boot up. When you hear two small tick sound which mean the camera is up successfully.